Fabstravagant (adj): Given to lavish or imprudent yardage estimates. I have a bad sewing habit: whenever I get to a cutting counter I often ask for more fabric than my pattern requirement specifies. But this week I decided enough was enough ( ... as opposed to enough is 1.25m extra, just for good measure). 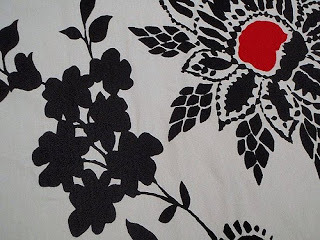 I located a favourite piece of fabric; a gorgeous "remnant" found at Tessuti some while ago. 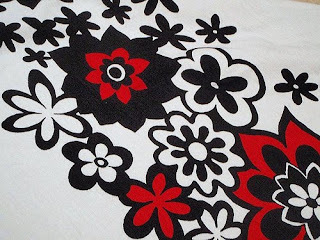 The slinky viscose-rayon - with a striking black and red floral print - has been a conundrum. Its large pattern repeat seemed best suited to a skirt, but at just 1.3 metres it seemed unlikely it would cover my lower half with any sort of dignity. So I decided to be creative. I employed sheer determination and various embarrassingly unorthodox layout and cutting methods. Somehow I managed to squeeze out the better part of another Kwik Sew 3513 pull-on knit skirt. To cover the inevitable shortfall, I bought a bit of black poly-cotton interlock for the waistband. Plus a wee bit more for a lining. And when I finished sewing up the skirt I felt triumphant and resourceful. Hooray! A skirt with a 1.85m fabric requirement made with a 1.3m remnant. Make a t-shirt for a small boy, I think you may find one or two around your house someplace. And then tell anyone, whether they ask or not, that that was your original intention all along. I just bought 2 metres of the most gorgeous check cotton, to make trousers for my mother. Who prefers the plain cord also bought at the same time. So now what will do with this lovely fabric? It's soooo nice and soft. I guess I'll just have to stroke it and keep it as a pet. Lovin' the skirts, keep on! I never know what I will do with the fabric so I just buy an amount I seem to pull out of thin air...Usually way too much!!! I do this alllll the time. I always just assume that I'll need more. Or to be extra hilarious I convince myself that 1 yard = 2 metres and the buy like 8 metres of something when all I really need is about 3. So much shame. oh I completely need to break that habit too!!! I normally get 1 extra metre minimum "to be safe" but it makes me lazy when I cut the pattern out. Oh good on you, great thinking! The skirt is gorgeous! I love the print, looks fantastic. Stunning Liesl. Can't wait to see it in real life. 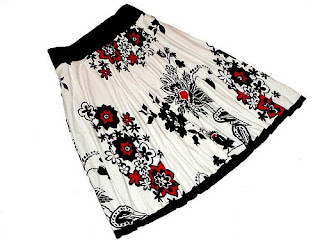 That is a super-fab skirt, and virtuous too. Oh, I completely understand the "insurance policy" buying Liesl. And how about the next part... the"even though I've got extra fabric, I'm so annoyed at my mistake and the time I've now wasted, that I'm not going to make this stupid pattern anyway"...?? Great job on the skirt. Impressive use of fabric so much smaller than they suggest and the black is perfect. I love the skirt! Love it! If you were selling it, I'd buy it. I always buy too much fabric, and while I am worried about mishaps that would warrant the use extra fabric, I think it's more of a trust issue. I just don't trust that that is all the fabric I'll really need. Buying fabric, I always get about 1.5 yards/meters, cause that is enough to make something, and enough to colorblock with another fabric if there is not quite enough. If I love love love the fabric, and KNOW I am going to use it for multiple things, I might get 2-4..but I have to really love it. My problem is, I keep moving overseas suddenly, and can't keep up. I have lost three complete fabric collections this way. Do you have any idea of the PAIN that inflicts? My advice now is, use it when you get it. Except, I also have the problem of living on an island, with very limited fabric choices..where collecting fabric is the only option to be able to get anything done when you want to. Ugh.